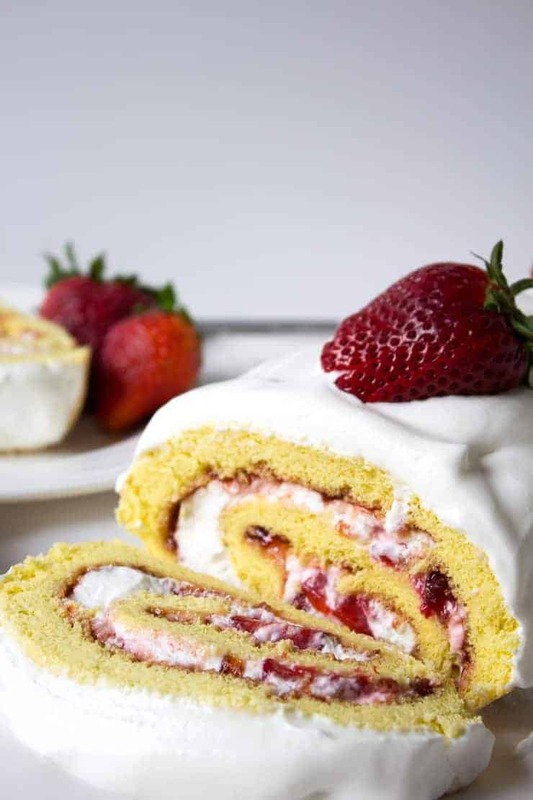 Fresh Strawberries and whipped cream rolled into a delicious sponge cake! 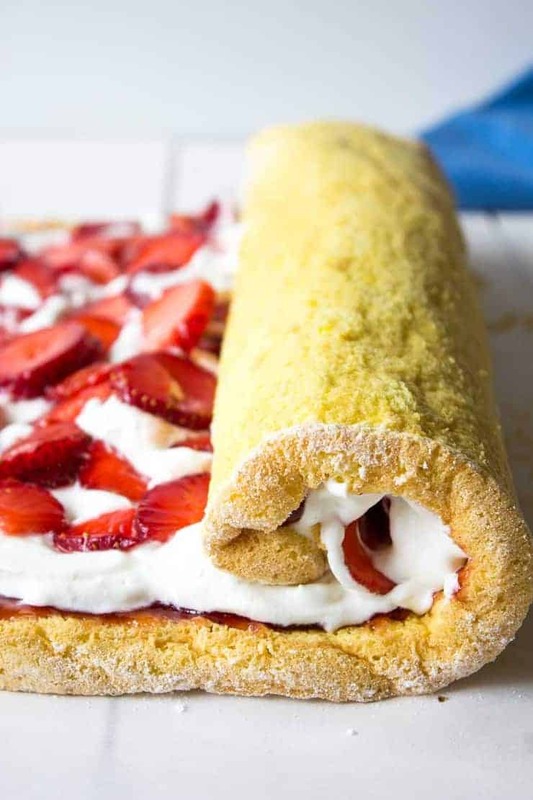 This strawberry roll cake is the recipe I had planned for last weekend when I was sidetracked at the grocery store by the huge bin of onions and made Onion Rings instead! This was my first time making a Swiss roll cake and I was a bit nervous. The whole idea of flipping over a cake and then rolling it up seemed difficult. I have to tell you it wasn’t difficult at all! Everything turned out beautifully. The trick to rolling a cake successfully is making certain you are ready when the cake comes out of the oven. Use a clean cotton towel. I used a thin flour sack dish towel. Lay the towel out on the counter and sprinkle with powdered sugar. Once the cake comes out of the oven, invert the baking sheet right onto the towel. Then roll up the cake with the towel. You roll while the cake is fresh out of the oven. The towel gets rolled right with the cake to keep the cake from sticking to itself. Once the cake is fully cooled, you can gently unroll, remove the towel and the cake will easily roll right back up again. The picture above shows the cake after the towel has been removed. Plan ahead when making this cake. It does require chilling time once it’s filled. You can bake the cake the day before, but once it’s filled you will want to serve it on the same day. Flourless Chocolate Cake – This one’s gluten free and super moist and fudgy. Strawberry Rhubarb Upside Down Cake – Fresh strawberries and rhubarb pair wonderfully together on this yellow cake. Lemon Bars – Pucker up! This is a classic lemon bar full of tart lemon flavor. 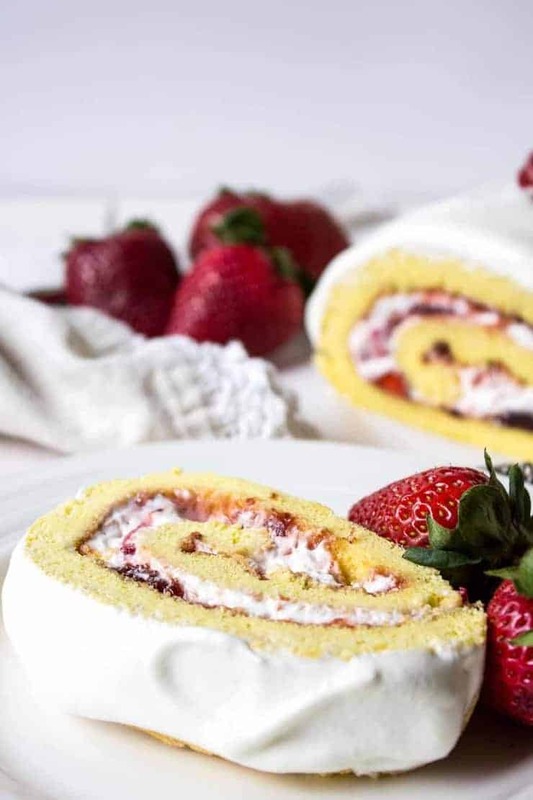 Strawberry Shortcake – Perfect for when strawberries are in season. This version has chocolate in the cakes! Carrot Cake – A classic carrot cake with a cream cheese frosting. Raspberry Brownies – Delicious chocolate paired with raspberries. Chocolate Mousse – Rich and decadent mousse. 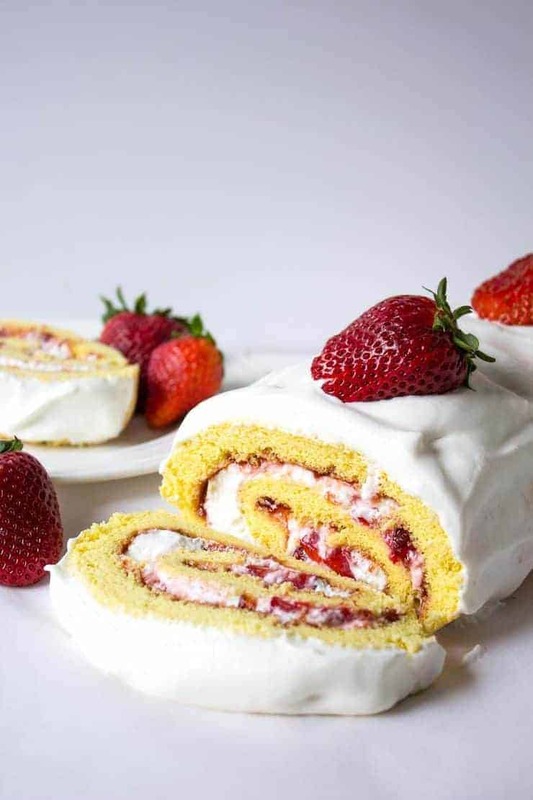 Fresh strawberries and whipped cream rolled into a light cake. Preheat oven to 375 degrees. Line a baking sheet pan (18" X 13") with parchment paper. Spray paper and sides lightly with a non-stick baking spray. 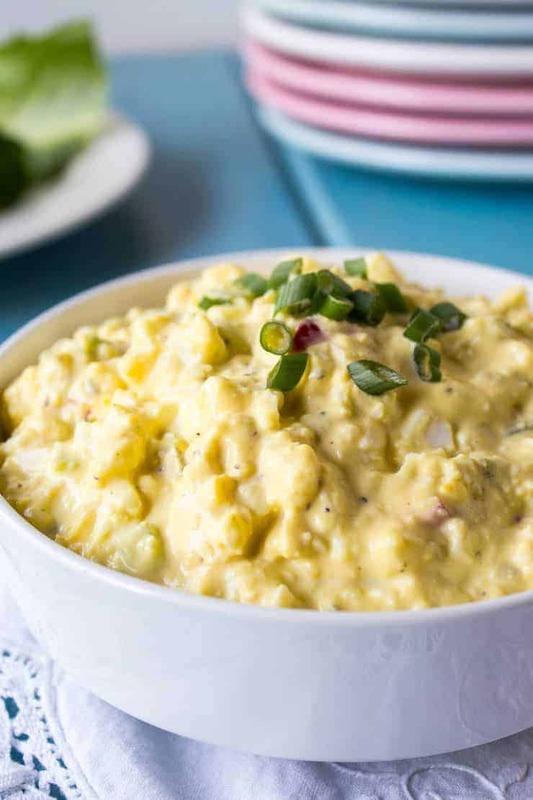 Place egg whites in a bowl. Mix with a mixer with a whisk attachment over high speed until light and foamy. With mixer running on a medium speed, slowly add 1/2 cup sugar. Return speed to high and continue mixing until stiff peaks are formed. Carefully remove whites from mixing bowl and set aside. In same mixing bowl, add egg yolks, 1/4 cup of sugar and vanilla. Mix with whisk attachment over high speed until pale yellow (3-4 minutes). Add 1/2 egg whites to batter. Gently fold in using a spatula. Repeat with remaining egg whites. Sprinkle 1/2 flour over egg mixture. Fold gently with a spatula until incorporated. Repeat with remaining flour. Place batter on prepared baking sheet pan. Spread evenly over baking sheet. Bake for 8-10 minutes until top is very lightly browned. Have a clean kitchen towel on counter. Sprinkle with powdered sugar. When cake is removed from oven, gently loosen the sides of the cake from the pan with a knife. Quickly invert the entire baking sheet pan onto the towel. Remove parchment paper. 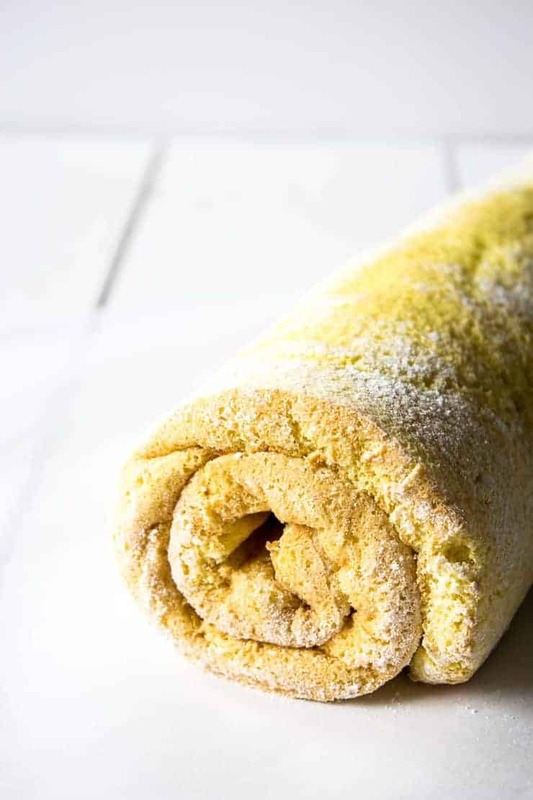 Starting with the short end, carefully roll cake (with towel). Set aside on a cooling rack until completely cooled. Slice strawberries into thin slices. Sprinkle with sugar. Stir slightly and set aside. Whip cream until soft peaks are formed. Add sugar and vanilla. Heat strawberry jam in microwave for 20-30 seconds until warm and runny. Spread jam on cake. Spread whipped cream over jam. Drain any excess liquid off strawberries and place strawberries in an even layer on cake. 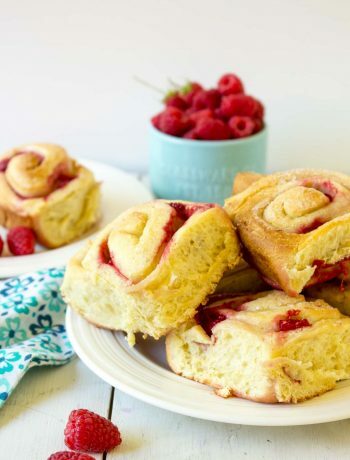 Starting with a short end of cake, carefully roll cake. Place on a tray with seam side down. Wrap with plastic wrap and refrigerate for at least 2 hours or until completely chilled. Whip remaining cream until soft peaks are formed. Add sugar and vanilla. Remove cake from refrigerator and remove plastic wrap. Gently spread whipped cream over top and sides of cake. Place strawberries on top of cake in a decorative manner. So yummy,,,, I need it now… 🙂 Can’t wait to try these…. 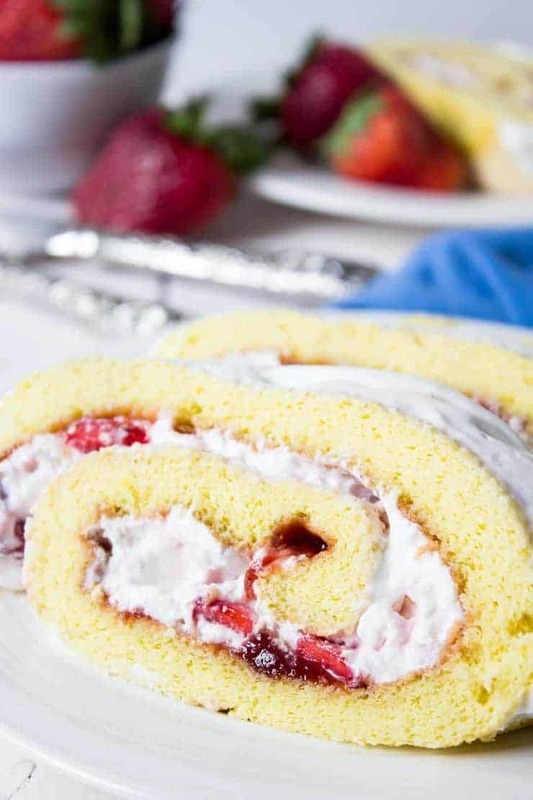 Wow, this was the first rolled cake you’ve made?! I haven’t ever made one (but have wanted to), so I’m encouraged by your success. It looks fantastic (not to mention irresistible)! This is a dreamy dessert! Beautiful in looks and amazing in flavors. Your sponge cake looks perfect, that’s why it rolled out so well. Great spring dessert, Kathy, I love it! Thanks! 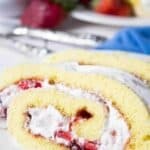 I’m already dreaming up more rolled cakes and trying to decide what to use as a filling! So many possibilities. I love cake rolls Kathy! And to be honest, I think I could single-handedly polish this one off! Looks amazing! If this doesn’t make me excited about summer, I don’t know what will! That roll is absolutely perfect too 🙂 Beauty of a dessert, my friend!